It’s great to wake up and have breakfast ready and waiting. Last night I made this coffee cake that I saw on La Vie Cerise and decided that it would be perfect for a Saturday morning with a whole lot of coffee. And it was. The topping was plentiful and sweet and the apples scattered throughout the cake added just the right amount of tartness to balance everything out. But the thing about baking this cake was that I started it quite late in the evening….after 1 am to be exact. And because it was so late, I wasn’t in best form and I missed an ingredient—baking powder. I didn’t realize it until I started typing out the recipe this morning. Doh! And since I’m in confession mode, I also over-baked this cake. I guess that’s what happens when it’s late and I’m not so focused. Oops! Not that you’d ever know it cuz this cake is good, miscalculations and all. So maybe my cake didn’t rise very much and was a bit too golden, it was still a fantastic way to start the day along with a whole lot of strong coffee. Want more? Why not head over to my latest post over at the Food Network Canada and say hi! Vancouver is quickly losing it’s history in the rush to build up a condo or two (thousand) and this weekend marks the end of Wally’s Burgers, a local burger joint. Read my write up on the Food Network Canada blog, Bazaar. Preheat oven to 400. Butter and flour an 8″ round cake pan, shaking off any excess flour. Prepare crumb topping in a medium-sized bowl, crumbling mixtures with your fingers until it looks like crumbs. Set aside. In a large bowl, mix together dry ingredients. In a smaller bowl, combine egg, milk and oil. Add the wet to the dry and mix. Add in apples and stir until combined. Pour batter into prepared pan and top with crumb mixture. Bake for 25-30 minutes or until a knife inserted in the centre comes out clean. Let cool. Prepare a pot of your favorite coffee and go to town. I could just about weep with gratitude to have something new to make with 6 bazillion apples still at the greenmarkets. You are my hero. Why oh why do I always end up looking a cooking blogs before bedtime? Now my stomach is grumbling! Looks like I’ll be making this tomorrow-yum! Baking powder or not, that coffee cake looks good and I bet it smelled heavenly when baking too. That cake is definitely something to make when the in-laws come by the house. I will return to this recipe at a later date and ensure that a container of ice cream is also in the freezer…yum! I was going through the same thing this weekend. I attempted to make granola on Saturday and burned it either by cooking it for too long or the temperature was too high. Your coffee cake looks delish, unlike my granola. wow, that is one dense cake. and i mean that in a good way. i could go for a big ol’ slice and a half-gallon of coffee right about now. i think i’ve got a case of the mondays. you are welcome, kristen! make it work. a. grace, this is super delicious and dense! yum. sylvie, it was actually hard to sleep since the smells at night were soooo good! bijoux, this would be great with ice cream! liberal foodie, ack! at least i’m not the only one! don’t worry, this weekend i burnt a pot of pasta. who does that?? wow, talk about a truly scrumptious way to start one’s morning – that coffee cake looks to-die-for delicious!! by the way, I AM still a loyal reader of your blog, I swear!! It’s just that my school-workload has prevented me (and still is preventing me) from commenting on all of my favorite blogs, as much as I would like to/used to. I’m such a late night baker; and yes sometimes, it’s a disaster, but other times it delivers the goods. I’m usually baking mine to eat immediately though, LOL! lyb, this makes a perfect breakfast! enjoy. veggiegirl, thanks for taking time out of your busy schedule to comment! it’s true, mevrouw, sometimes it works and sometimes it doesn’t. this time, it was a bit of both! haha, hag! 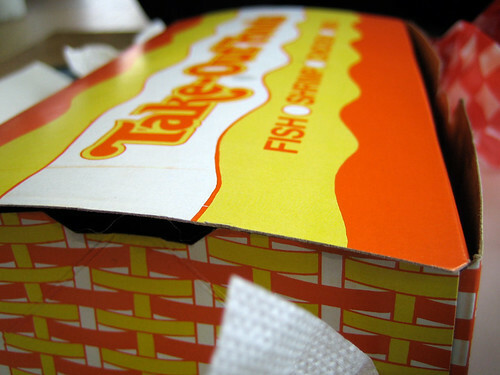 yes, a box of fries at wally’s…sniff! liberal foodie, it’s the saddest (and smelliest) thing, believe me! marusya, thanks for the tag, but i’m totally lame and probably won’t participate. please forgive me!!! 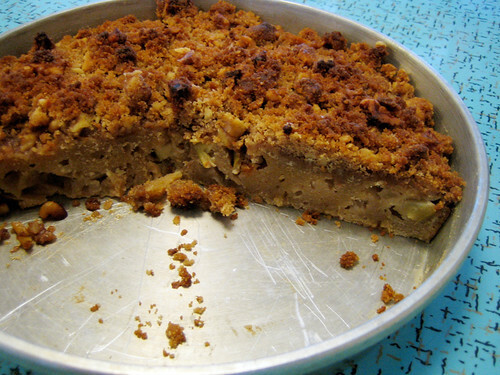 Maria Muldar would be very pleased with your coffee cake….what a great thing to wake up to! I liked your Wally’s post too! I didn’t know you could get a BOX of fries!! Oh boy, this looks so good. I don’t think I want it with baking powder. Definitely need to add to the to-bake list. this was a perfect recipe. I was so sad when I ate the last slice. I did use the baking powder, and I think it made it wonderfully light & fluffy. I also added fresh grated nutmeg to the batter because I have a newish zester (the microplane kind) that is so fun to use. I will definitely be making this again, maybe even this weekend. eatme, i’m glad i’m not the only one!! jessica, if you do try it, let me know! glad you loved it, maija, i’ll definitely bake this again with bp and i love the addition of nutmeg! yum. judy, it’s a good cake to eat! it’s gone before you know it. lydia, try it! i’m not a fan of custard (actually, i’m not sure if i’ve ever had any! )…but give it a go! ooooh I have just discovered you and your blog and I am enjoying immensely. I’ll be back….just off to bake this cake…!! Do you think this would be good with some custard on top? It looks really good, and I’ve got a can of runny English custard (the kind that’s perfect in trifle) staring balefully at me in the cupboard. What a great way to start your morning! I’d certainly have made more mistakes than that if I tried to bake at 1 am! 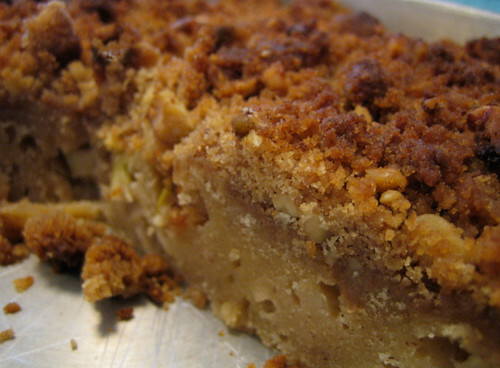 Mmm coffee cakes are so my favorite – add apples and I’m a happy girl. I love all your recipes and this looks like a wonderful breakfast. By the way, your blog inspired me to start my own here: sarahweigum.com/blog. Come visit if you get a chance. Hi. I really wanted to exchange links! My website is http://www.mychocolateheaven.blogspot.com I hope you like my site as much as I do yours! haha. I have already added your website to mine and I hope you can return the favor. If you do get a chance, please inform me at my website. Thanks!!! This looks amazing! I love coffee cake. This looks great! I love crumb cake and will have to try this recipe. Fixed it, loved it, neighbors loved it, kids liked it better with some whipped cream. Just made this cake for Thanksgiving. It was so good that I had two servings..one with custard and one without! I prefer it without custard because you can taste the fluffy light texture more. I did end up with not enough crumb mixture for the topping though but I always find this. Is it because most of it got stuck to my fingers? Is there any way around this?